Hey all, We’re in Mexico City. We arrived yesterday mid afternoon, both excited and exhausted. After a bit of misadventure, all our taxis made it to the hostel, safe and sound. We are staying at Casa de los Amigos, a Quaker guesthouse (It’s amazing. The beds are like clouds and we all slept very well). We were treated to a tasty dinner with brownies for dessert, made for us by Mara, a SALTer placed here. She along with Chris and Heidi, MCC workers here in Mexico City, joined us for dinner. We will be visiting historic sites and museums, attending church here in the city, and visiting a centre for migrants. Today we’re off to meet with a Young Adult Mennonite group here in the city and have no clue what they have in store. It’s an adventure. Wishing you all a great day back home or wherever you are reading this from. Thanks for following our journey! The Northern Border – A Photo Journey – Thanks to Jennifer Deibert for the amazing photos! Zeek’s Pizza! First stop after arriving in Arizona! Coffee! Buying treats for all our loved ones at Cafe Justo. Walking in the desert with Shura of Green Valley Samaritans. Visit to Tirabichi, the City dump, where over 70 families live and gather recycling to sell and earn a living. A very resourceful place. Vigil for Jose Antonio. 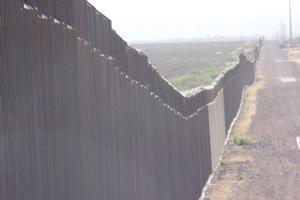 A 16 year old boy shot by the border patrol on October 10, 2012. Elena, a volunteer from HEPAC, hosted us for dinner at her house. Chimichanga’s, Taco’s, Guacamole, Frijoles, Muy Rico! Kid’s camp afternoon at HEPAC. Vigil in Douglas, AZ. No Mas Muertes. No more deaths. Each of the crosses represents an individual who attempted crossing and passed away in the desert . We held up and laid on the curb over 400 crosses. Our slumberparty room in Augua Prieta. The ladies dragged all our mattresses together into the library to avoid the dust in our room. Jolene practices for her future retirement, imagining Brad at her side. Learning about the sustainable agriculture efforts of DouglaPrieta, a community centre for women and families to come together and learn about sustainable gardening, cooking with a variety of vegetables they can grow themselves, and sewing among many other things! 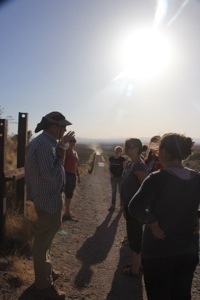 A tour of the wall with Mark Adam’s of Frontera de Christo. DouglaPrieta, a sustainable agriculture co-op and community centre in Agua Prieta. only to stop, was the tire going to explode? Sandra, Luzdy, Jenny, Jeannette… Adios! Our week at the border, time well spent. Wednesday, we spent the day in Agua Prieta, hosted by Frontera de Christo, their programs and the many volunteers and participants who take part in them. Agua Prieta is a city that extends up to the Mexico side of the border wall, with Douglas, AZ directly on the other side. In many ways it seems much like Nogales, one big city split by a wall and a border, and a lot of security. Here we met Frontera de Christo staff who live and work on both sides. An interesting choice to be intentional and inviting in their ministry which takes place on both sides with individuals and families on both sides who are not able to cross to the other. On a related interesting note; This morning as we left Agua Prieta for Tucson, we waited in line for an hour in “rush hour traffic”, which is really traffic trying to cross the border to get themselves to work, or their kids to school. There are families that live on one side and go to school and/or work on the other. They cross the wall every day. We witnessed children being dropped off for school in Mexico, walking across a school crosswalk, to show their passport and enter into the USA in order to get to school. A very different reality from my own. The following blog post is long, but it runs through our time in Agua Prieta, arriving May 13th and spending the day on the 14th. 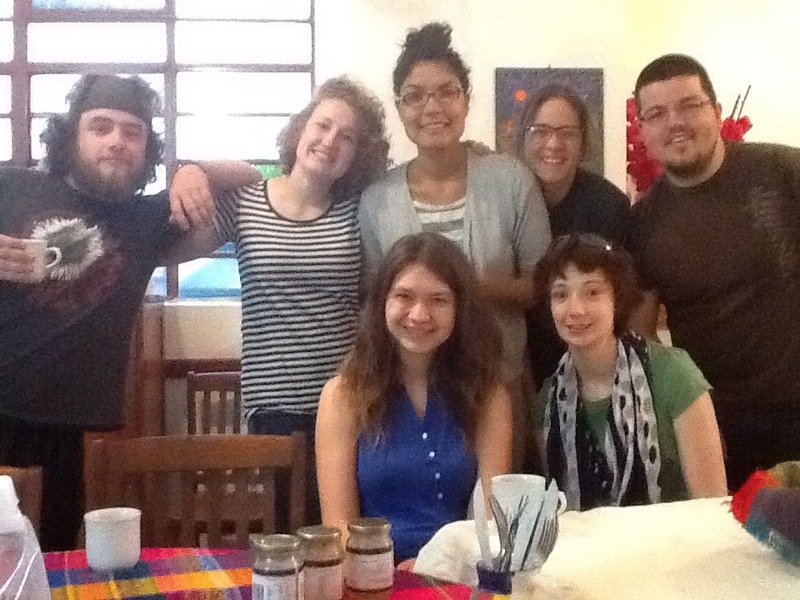 We began our day at cafe Justo, where we learned about direct trade coffee. We learned not only how coffee is grown and processed, but also the difficulties the coffee farmers face in Chiapas. 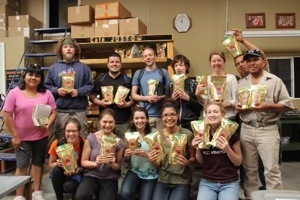 Cafe Justo is a coffee co-op that was made by twenty families and is now thirty. The company is able to provide their workers with a decent wage and benefits. We had the opportunity to watch coffee beans get roasted in a special machine. It was fascinating to watch and the aroma smelled heavenly. It further inspired us to purchase some of their coffee. We learned that buying 1 pound of coffee supports 13 children and their families. Ten dollars for 1 pound we figured, why not! While we are in Chiapas; we look forward to meeting some of these families, and wonder what stories they have to tell. Over lunch we visited DouglaPrieta Works, a community centre where Families come me together to farm and learn about sustainable farming practices in hue he Sonora Dessert. They have sewing classes where they sell bags and other items in the community and to visitors like ourselves, and cooking classes where they share with one another, how to use the vegetables they grow. Lucky for us they are successful. We enjoyed a delicious lunch of tamales and beans, and fresh cantaloupe juice! Muy Rico! In the afternoon we went to the Migrant Resource Center, which started in 2006. They deal with lateral retribution meaning people are deported to a different place then where they entered, this is meant to make it harder for them to get back home. This Centre has 60% lateral retribution. They offer migrants an orientation, water, food and anything else they may need. They tell the participants the dangers of crossing and what to bring when they do, ex: healthy food, matches, etc. We departed from Frontera de Cristo’s office which is about nine blocks away from the USA/Mexican border fence on the American side. Mark has lived ‘on both sides of the border’ in Douglas and Aguaprieta since 2000. We were able to learn a wealth of knowledge from him as he has first hand experience with living on both sides of the border and what that means for residence and more specifically his family. For instance, his family home is on the Mexican side, but he works on both (primarily the USA side), his daughter babysits and goes to school on the USA side while his wife works on the Mexican. He told us a bit about the history of this area and the implications of different events that happened around 1994: NAFTA, Hold the Line, Operation Gate Keeper (and other region specific immigration laws to ‘protect the border’). At the same time as immigration was largely being prohibited the USA, during the 1990s, the USA had an increase in need for labour. With all this said and done, the Aguaprieta/Douglas border area became a major place for illegal migration. As we drove about 4 miles down the border fence we had the 15 foot fence on our one side and the open dessert on the other. As we drove Border Patrol trucks, quads and dirt bikes were spotted throughout the dessert area searching for migratns. It was a very surreal site to see. The final event we did last night was to serve and have dinner at the CAME (Centro de Atencion a Migrante Exodo), it’s a centre for migrants to eat and sleep. We were there to serve and eat a meal with the participants. The first encounter was with a man who was taken a back as to why we where there. After explaining that we wanted to listen and take stories back home to make people aware of the border issues we all sat down for a meal. My experience was wonderful! At first Davida, Sandra and I made as much small talk in broken english and spanish as possible with Sandra interpreting. They’re eyes lit up after I offered to teach them Spanish if they would teach us English. Time flew by as we went over simple phrases back and forth. Soon a few more joined us and we were all laughing and exclaiming “Bien, Bien!” (Good, good) when they replied in English. It was quite the contrast from the beginning of the meal to the end. All in all it was a good experience for everyone, as we were able to talk about families and each others lives other then migration. We left laughing with each other and shaking hands, it was wonderful. Back at our accommodations, Tito made the best guacamole and we enjoyed a quiet evening looking at pictures of the trip. Thank you all for your prayers! Hello to our readers. After over 24 hours without wifi, we are frantically trying to message people back home. We may be internet addicts. 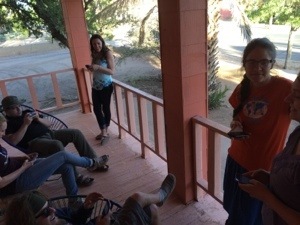 If we haven’t got to texting our parents, let them know we are alive and well in Agua Prieta, heading back to Tucson and then Phoenix tomorrow, before flying to Mexico City. We will catch up on blogging then. Take care all! The day started off by heading to a Maquila. The company was called Denticon. They employed around 70 people and they specialized in the creation of dentures and other mouth appliances. This Maquila pays anywhere from 200-1200 pesos per day of work. After a discussion with the manager we got a chance to tour the facility and see the working conditions. We talked with a few employees and saw their work, which the manager stressed was only able to be done by people that were very skilled. Particularly those that worked in the porcelain department. They worked to match the colour of the fake teeth to those of the persons actual teeth. It seemed quite difficult and time consuming. As a person in the process of getting some fake teeth, it was weird to think that they may come from a facility such as this. After going to the Maquila we went to the Maquila association. There we met with people who lobbied on behalf of the 99 Maquilas in Nogales. They heavily supported Maquilas in Nogales and believed they were the way to create economic sustainability in the region. Currently Maquilas in Nogales employ approximately 35,000 people. They believe anyone that wants a job in Nogales can have one, because of Maquilas. They believe anyone without a job has chosen that route, there are always jobs in the Maquilas. This association also prides themselves on their role in community development. They have put about 1.3 million dollars back into the Nogales community. Through supporting government initiatives they helped to create fire departments, schools and other social infrastructure. They did however leave out of the discussion the fact that they lobbied on behalf of the Maquilas, not the workers. They also failed to highlight issues of workers rights in the workplace. Or the lack of knowledge workers have on their rights as workers. He did make them seem quite grand in theory, but failed to portray Maquilas as accountable businesses. We had already heard the story of Legacy, a Maquila that shut down and took all of their equipment out one weekend. When people came to work the next week they had no jobs and no equipment. Although they seemed to have had some great hard facts about what the Maquilas were doing in the community. Relationally we could still see places where they were lacking. This encounter left many of us with many questions. After lunch we had to set up for kids camp. But no kids arrived! So we trucked around the streets for a while yelling at kids telling them to come to HEPAC. It was quite a sight to see. It was nothing like I had ever seen. After creating a sufficient group of about 30 kids we started the camp. There were sports, music and crafts aspects of the camp. Joel, Thomas and I ran the sports aspect of the camp and that was a blast. We played soccer with lots of kids all with varying levels of intensity. After getting called gringo a few times after missing passes we probably should have had, the camp was done. After a short little break it was time for supper. After supper we immediately headed to a migrant shelter called San Juan Bosco Albegue. There were many migrants there who all had very different stories. We had the chance to hear some of their stories in smaller groups of about 3 or 4 people. One very compelling story I heard was that of Christian and Dennis who were 16 and 19 years old. They had come from El Salvador via “the beast”. A train that travels all through Mexico. They had a 26 day journey riding on top of this train. Along the way they had struggles though. While riding the train one night Dennis struck a power line and was electrocuted. He said he remembered nothing of the event and was unconscious for a few hours atop the train. His cousin Christian took care of him on top of the train. Dennis had electrical burns all over his shoulder and side of his head. After the group prayed with them we left the shelter and came back for sleep. It was a very long day. Sorry to all our parents for not getting anything up last night. We are safe and doing well, but had a full day and late night without much energy to reflect in a blog. Tyler is currently writing a blog which we will post later today. Wishing you all well back in Canada, or from wherever you are reading this. Thanks for following our journey and for the many comments and responses. We appreciate you walking with us.